And so it begins! The Great Bretonnian Crusade has been called, the horns have been sounded and the noble knights ride once more to war. Lord Sechnaill Mac Domnaill has answered the call, taking the battle straight to the Vampire Counts for the glory of the Lady of the Lake. Being my first battle report for Bretonnians, I thought it fitting that this is also my first Battle Report for the Bretonnian Crusade, as mentioned in the Youtube video above from TheSustainableCentre, this is a push from Bretonnian players around the world to publish their battles and make it known that they're still an active army and would really rather not be phased out. My list for this battle was fairly straight forwards, unfortunately I do not have as many Bretonnians painted as I do Ogres. 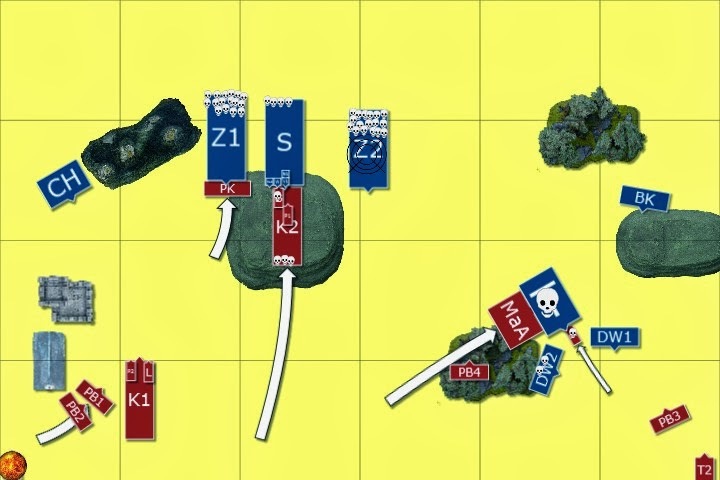 My plan here was to try to get my Lord into a position to do the maximum hurt on whatever Vampire-bus he throws my way, with the Trebuchets to thin out their numbers, and the Peasants for fire support and to add an extra layer of obstruction in front of the Trebs. The Grail Knights should provide a decent flanking threat and the Pegasus Knights should be able to either counter his chaff or shut down any horrible screamers he feels like sending my way. Men at arms will die. That's their job. My opponent was nice enough to provide me with a copy of his army list and notes to help me complete my battle report (as he would be doing his own as well). Looked like I had my work cut out for me, with 3 big blocks of infantry and that Terrorgheist rocking around causing issues. Plus I hadn't faced a fully tooled out Vampire Lord until this point, so I was definitely in for a treat. 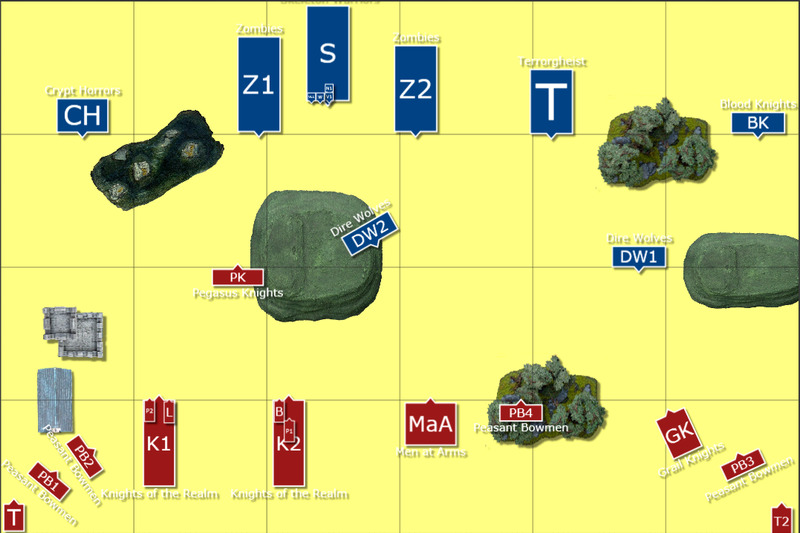 The Scenario is Battleline, the armies have arrived. Let us survey the carnage. The forces of Lord Sechnaill rallied upon the plains, ready to do battle with the accursed vampire counts and cleanse the land of their filth. The Grail Knights nobly chose to take the fight to the Terrorgheist while the Knights of the Realm, lead by none other than Lord Sechnaill himself, would handle the Vampire and his minions. Peasant Bowmen would protect the war machines and attempt to guard the flanks, while the mighty Pegasus Knights flew ahead to protect the lances. Meanwhile, the forces of the Vampire Lord took to the field, tireless Zombies flanking either side of his retinue, Terrorgheist and Dogs ranging out wide and the Blood Knights eternal thirst would only be sated by sweet sweet peasant blood. Crypt Horrors were to return to their marshy homelands and revel in the muck that they knew so well. Lord Sechnaill and his Prophetess lead the men of the Bretonnian forces in prayer, while the Vampire Lord seizes the opportunity and advances maliciously. With the Dire Wolves having made their move forwards, they barrel full speed towards the Grail Knights, their jowls dripping in anticipation of tasting manflesh. The Vampire Lord keeps them in check, however, and directs them to screen for his pet the Terrorgheist. Blood Knights take up position to the rear, ready to clean up any survivors after the beasts are through. Skeletal warriors and Zombies advance towards the Knights position, as do the Crypt ghouls. Magic was largely inoffensive, with a very low Winds of Magic yielding only enough dice for a single spell. Gaze of Nagash is harmlessly dispelled from the Pegasus Knights. To make up for his master's will being thwarted, the Terrorgheist screams mightily, ripping 5 out of 6 Grail Knights from their horses and shattering their remains. The lone Grail Knights stands defiant, if somewhat lonely. After a somewhat unfortunate start, the surviving Grail Knight decides to avenge his fallen brothers and claim honour and glory for the Lady of the Lake. He valiantly charges the Terrorgheist, past the slavering jowls of the Dire Wolves and into hand to hand (or lance to chest) combat with the beast. The large block of Men at Arms, inspired by the noble knight's valour (or completely ignorant of the danger they faced) also joined in the charge. Meanwhile, the Pegasus Knights charged into the first large block of Zombies while the BSB and Prophetess drove their lance deep into the belly of the beast, charging into the Vampire Lord's retinue. Lord Sechnaill took the opportunity to line himself up for a better charge. The winds of magic remained weak at this stage, and the Prophetess was only able to get off Throne of Vines, before failing to cast Shield of Thorns upon her unit. The peasant Field Trebuchets provided mixed results, with one of them destroying 17 Zombies while the other was clearly incompetently assembled and exploded. This gave the Bowmen guarding it a terrible fright and they proceeded to charge towards the enemy in what we can only assume was some form of Fear Rage. The archers over on the right hand side of the field however managed to keep their nerve, and unloaded into the Dire Wolves, slaying 2 of them. In combat, the Terrorgheist slew the Grail Knight, but not before he drove his lance deep into the beast's body. He was then set upon by the Men At Arms, who proceeded to inflict 3 substantial wounds on the beast before its fell magics came undone. The Men at Arms Overran from their victory to collide with the Dire Wolves facing off against the Trebuchet.. The Pegasus Knights smashed into the Zombies, bringing down 9 of their number, with their magic failing another 7. The Vampire Lord put one wound on the Bretonnian BSB in a challenge, while the Knights of the Realm took a measly 3 skeletons, losing 3 Knights in return. Vampires are on the offence, and the charge of the Bretonnian Knights has been blunted. 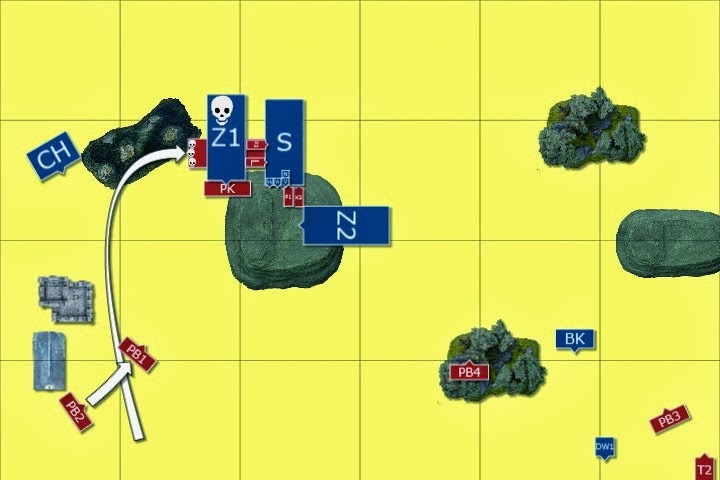 With the initial brunt of the assault having been absorbed and taken away, the flanking Zombie unit charged into combat to slay the Knights of the Realm and protect their masters. Blood Knights give in to their relentless thirst and charge into the flank of the Men at Arms, while the Crypt Horrors reposition themselves out of charge range of the General's Knightly Lance. In a flurry of magic, squeezing what he can from the low winds of magic, the Vampire Lord is prevented from casting his boosting spells, but instead the two vampires manage to get off double Invocation of Nehek, raising more undead to bring to bear against the Bretonnian forces. The fight between the Pegasus Knights and the Zombies continues unabated, the zombies having received reinforcements, but still not being able to crack that hard Bretonnian armour. The Pegasus Knights, for their efforts, are rewarded with only a small number of Zombies being killed. In the main combat, the Vampire Lord blends the Bretonnian BSB, with a three wound overkill as his mighty blade hews through his flesh again and again. 3 Knights fall to blows from the Vampire and her entourage, only claiming a handful of skeletons and zombies in return. Bretonnians lose combat, however hold due to their stubbornness. The Men at Arms are beseiged by the Blood Knights, who tear through 8 of their number. The mighty peasants managed to slay 3 of the Dire Wolves and one of the blood knights before they think better of fighting the foe and run for the safety of the forests off the battle field. Unfortunately, they are cut down before they make it. The Blood Knights managed to wind up in sight of the Peasant Bowmen, in time to see them cut down the Dire Wolves assaulting them, both by cutting down their number in shooting and besting them in combat. Lord Sechnaill, having witnessed his men being slaughtered decided that he must join the fight. With a mighty roar, the Knights of the Realm charge into battle, their Lord leading the way swinging his morning star. 1 Knight is lost in the charge. Behind him, the Peasant Bowmen continue their own charge, still fleeing the death of their war machine they charge directly into the face of the enemy. The Winds of Magic continued to blow softly, however the Prophetess was able to cast Regrowth with irresistable force, returning 2 Knights back to the fray and restoring a wound on herself. From upon her throne of vines she shakes off the effects of so mighty a channelling. The Bretonnian Archers continue to have not a lot of luck with their shooting, both units choosing to fire at the Blood Knights without much success. The Peasant Bowmen on the left side fire at the Crypt Horrors, but they merely reknit their wounds. The Blood Knights continue their ever-thirsty charge, and barrel full force into the Peasant Bowmen protecting the Trebuchet, Crypt Horrors take the fight to the Pegasus Knights, pinning them down before they can fly away again. The Winds of Magic continued to blow weakly, and the Vampire Lord was unable to muster the power to bring any more undead into the fight. Meanwhile, Crypt Horrors dragged down a Pegasus Knight to his untimely demise, while taking no wounds in return due to their rapid regeneration. Blood Knights shatter the ranks of peasant bowmen and overrun into the Trebuchet. In the middle, the Wight King steps up to meet Lord Sechnaill's challenge, with both heroes landing killing blows, Lord Sechnaills tore through the Wight King's regeneration, while the Lady shielded him from certain death (courtesy of a boosted Blessing due to the high strength of the Wight King's attack). The Vampire brings down the Prophetess's last champion and leaves her exposed to the attacks of the Skeletons, who fail to do any telling damage at this stage. Without direct leadership, the Peasant Bowmen continue their valiant flee-charge towards the enemy. The left flank bowmen seek the protection of the Chapel nearby while the ones in the forest turn to face the oncoming enemy. In what was to be her final phase of magic, the Prophetess of the Lady cast an Irresistable Regrowth upon the General's knights, restoring 3 of their number to the battle and healing herself. The Vampire Lord managed to dispel her Shield of Thorns before it was cast. With nothing that was able to shoot, we moved directly into combat. Blood thirsty Blood Knights feast upon the crew of the Trebuchet, chasing down their meal and running off the board in their hunger. The large Zombie block, having run out of things to kill, barrels into the last surviving Pegasus Knight, hoping to join in on the Crypt Horrors' feast. Blood Knights return to the field of battle, but lack a target to charge. The Dire Wolves make a bee line for safety. Without the Prophetess to dampen their efforts, the surviving vampires get off a pair of Invocation of Nehek spells, bringing more skeletons into the fray while the Zombies and Crypt Ghouls tear the surviving Pegasus Knight to shreds. 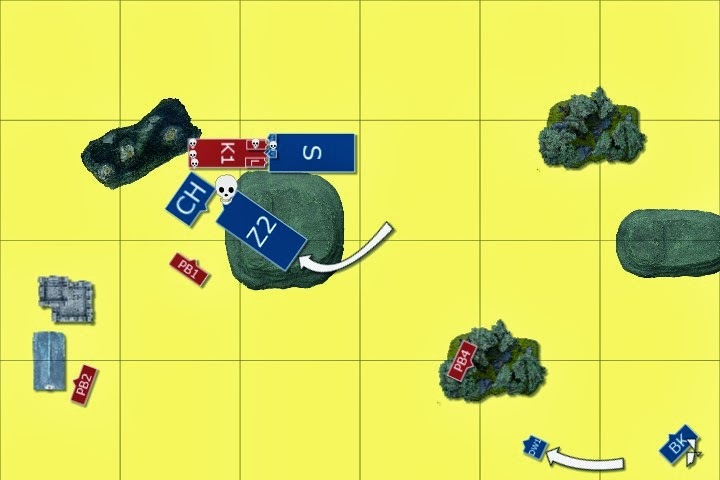 Lord Sechnaill continues his quest for an honourable combat, smashing another Skeleton Champion under his morning star and turning his gaze to the two surviving vampires. For his trouble the Vampire Lord obliterates the Paladin riding with him, and the Vampiress lays waste to the Knights of his retinue. Surviving Peasant Bowmen take cover in the Chapel, bows aimed at the Crypt Horrors, meanwhile the Peasant Bowmen draw beads on the Dire Wolves. The raging peasants refused to listen to their Lord and finally achieve their charge, smashing through the Crypt Horrors, Knights of the Realm and coming out the other side (through the Marshlands). 5 Bowmen died in their terrified charge, yet still they ran on. Peasant Bowmen proved to be the re-death of the Dire Wolves, shooting down the last two of their number. Shooting against the Crypt Horrors was largely ineffective, while in combat the Lord finally got his hands on a Vampire, smashing the Vampiress's sword of striking with the chains of the Morningstar of Fracasse. Unfortunately, she warded off the wounds and dealt none in return. The Vampire Lord laid waste to the assembled Knights, and Lord Sechnaill was unable to maintain their morale, with the army running away and being cut down by the Skeleton Warriors. Pain. The first thing that Lord Sechnaill could remember was pain upon awakening. His eyes opened slowly upon his stretcher, and he looked upon the face of one of the men carrying him. Dark and misshapen, with little hair and far fewer teeth the man had a mighty longbow strapped across his back. While it would later become clear this his wounds weren't mortal, the memory of the defeat suffered that day came to him, and he swore a silent oath to the Lady that he would return to right his mistakes, to regain his honour. But he was alive, and a living man can regain honour that the dead cannot understand. It was at this point that we called the game. Of the Bretonnian forces, only 3 units of Peasant Bowmen remained, while the Vampire forces still held 2 large units, 2 vampires and the surviving Blood Knights. This was a telling loss for Lord Sechnaill and his forces, and one that will be remembered. From my point, I feel my first mistake was charging the BSB Lance in alone when the General's lance couldn't make the charge. But, you live and you learn, as charging first turn also meant that I couldn't get Dweller's Below off for the entire game. As always, Steve is an absolute pleasure to play, and I look forwards to our rematch with the same forces. 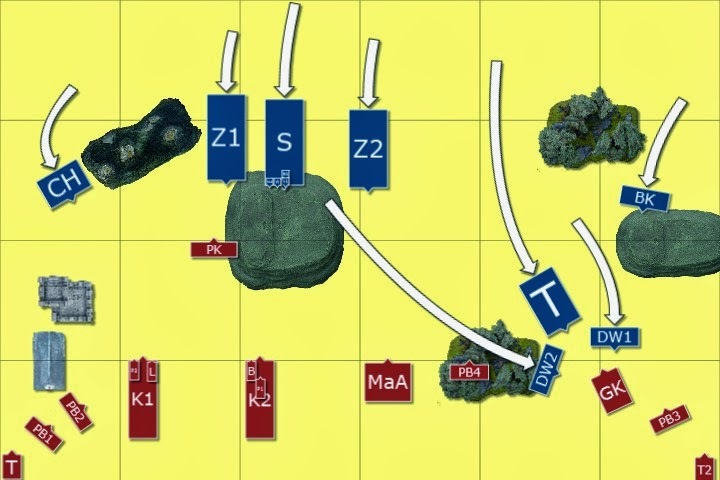 Thank you very much for reading my battle report, I hope you enjoyed it as much as I enjoyed our game. Unfortunately, I was not able to chalk up a win for the Lady of the Lake this day, but comeuppance is coming and the Bretonnian Crusade cannot be stopped. Nice battle reports. Love the maps. I am new to Bretonnia myself, so I am interested in learning from your experiences. Thank you very much! The maps are all done with a program called Battle Chronicler. Always good to have new Knights added to the fold.